Rumor has it that the Yankees will be scaling back the payroll? Maybe they don't get Miquel Cabrera, Roy Halladay and John Lackey, and resign Damon and Matsui as almost every web site would have you believe. It does raise a point, however. The Yankees have a glitzy new stadium, and just won the World Series. How could they need to reduce payroll? out-of-control Brett Farve? Seriously, some of his passes were so wild, so ridiculous....he needs a very patient, very good quarterback coach to show him how to use his cannon of an arm. Not sure if Mike Shannahan will be an immediate fit for the Bills, but am glad to see that they are pulling out the stops and showing their fans that they are trying very hard to get back to respectability. I don't know about you, but that lineup isn't exactly generating the jollies inside of me. And no one can tell me right now, that NCAA FB shouldn't have a playoff because it would ruin the integrity and excitement of the bow system. Cincinnati vs. TCU? Oregon State vs. Ohio State. Sorry, but watching a playoff system—even an imperfect one—would be worlds better than this. So, who the heck placed a first-place vote for Miquel Cabrera? I mean, sure, he had a nice year, but a better year than Mauer? It's ridiculous. Let's hear it for Roy "I'm a number one receiver" Williams. 0 catches for 0 yards against the unbeatable Redskin secondary. Williams was throw to 4 times by the way, and caught none of them. Oh, and Miles "he's a number 2 receiver" Austin, Roy? 4 catches. Not great, but a lot better than a goose egg. The Buccaneers are running out of coordinators to blame for their atrocious play. Between the Victor Martinez trade, the Cliff Lee trade and the CC Sabathia trade, the Cleveland Indians have stockpiled a megaton of quality young talent. Maybe not ready for 2010. But 2011 they should have so serious talent. Carlos Santana, the catcher primed to replace Martinez was ranked the 2nd best prospect by Project Prospect. Matt Laporta, Hector Rondon, Carlos Carrasco and Nick Weglarz are also on the Top 25. And that doesn't include Justin Masterson, who the Indians got from the Red Sox, Yahan Pino from the Twins in the Carl Pavano trade, David Huff, Scott Barnes, Connor Graham, Michael Brantley Adam Miller, Kelvin de la Cruz or Beau Mills, all of whom are well-thought of in the Indians system. The Indians have been reloading for over a year now, and pretty soon, they should be a very intimidating, young team. Can't believe I'm going to do this, but the AAPTBNL Man of the Week goes to....Brady Quinn. Yes, I know he played the Detroit Lions, and my niece could quarterback against those guys. But Brady, who came into the game completing roughly 8 % of his passes, went out, and playing with a talent-deficient receiving crew and enduring the second-guessing of nearly every human being on the planet, went out and threw 4 TD passes, no interceptions, and 300 yards. True the Browns didn't win the game, but that wasn't Quinn's fault. And to be fair to Quinn, who's getting calls from all over that he's not NFL material, the kid has played in a grand total of 10 games, all with a really poor team. So congrats Brady; hope this is the start of something a lot better. And finally, House acknowledges that Forman is a the long-lost brother of Mike Tomlin. Go watch it; very funny. 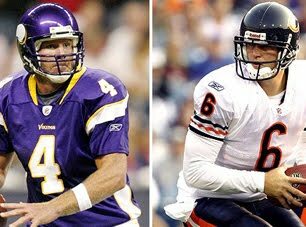 I've been saying for the past month or so that Cutler reminds me of Jeff George. A cannon of an arm who trusts it way to much, thus all of the INTs. Roy Williams. Where do I begin? This deal doesn't get nearly as much scrutiny as the Joey Galloway trade did around here, simply because, IMO, he played for the Longhorns. 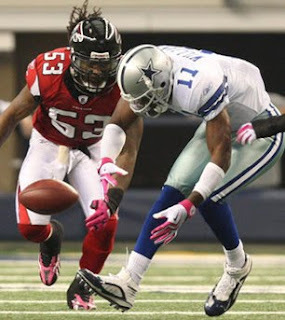 The Cowboys did give up a lot for Galloway, but he actually produced. Williams blows and has a new excuse every week.